Are you worried about who is using your network? Do you wish to prevent issues like slow speed, data sniffing and privacy violations of the users on the network? A growing network with more users is even more in need of some form of monitoring. This can seem like quite the task- however, there are a number of network monitoring software that offers a simple and highly effective solution to this. 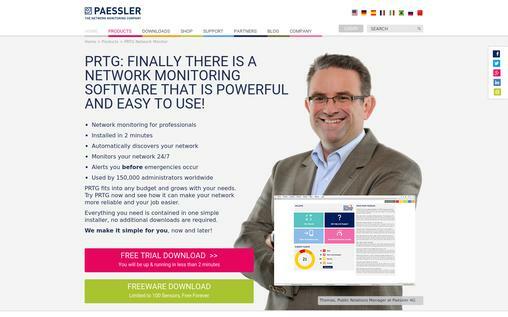 A Network Monitoring Software helps you have a comprehensive view of what is going on inside and with your network. You can track the total users in the network, bandwidth of individual users, resources present in the network, components of network & their health, detect and resolve issues and do a lot more. In short, a network monitoring software is a simplified way to manage the network and secure your businesses’ IT infrastructure. PRTG Network Monitor is a tool that can monitor all the parts of your IT infrastructure- including every system, device as well as an application deployed on it. This tool is compatible with all types of networks, including LANs, WANs and servers. It can be used for monitoring the performance of virtual environments. PRTG Network Monitor has been around since 1997. It comes with a simple installation procedure, and takes just a few minutes to setup and start running. Auto-discovery of networks helps it to recognize all the systems and devices on a network, and create sensors using predefined templates, thus simplifying the configuration process. PRTG Maps can be created from the monitoring data to have a better understanding of the network. Alerts are provided in case of unexpected metrics and warnings, which can be sent via mobile apps and push notifications, SMS and email. It is available only for Windows users, though the mobile apps are available on Android and iOS devices too. Free trial and freeware versions available. Starts at $1,600 for the PRTG 500 with 500 sensors, and go up to $60,000 for the PRTG XL5 with unlimited sensors. IPHost Network Monitor allows you to monitor your network, ensure that your websites are online and keep a tab on the internet access. It has the capability to send across alerts almost immediately incase of a problem or any other issue in the network. The system administrator’s work can also be reviewed using this tool. It can be used by companies and networks of all sizes. Advanced monitoring capabilities with a simulation of the real user activity. It can monitor websites, databases, emails and all other servers, equipment, and resources. Installation takes less than 2 minutes. Lightweight and robust, with more than 40 methods of monitoring. Free trial version, $199/200 monitors, $1499 for unlimited monitors. For those who wish to get an easy to install and lightweight network monitoring utility, IPHost Monitor is one of the best options out there. 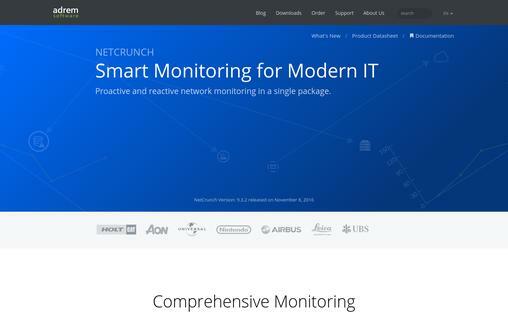 NetCrunch is a network monitoring tool that can be used with the infrastructure devices, applications, servers as well as virtualization hosts. It can be configured to deliver results from syslog messages, SNMP traps, Windows event logs as well as a host of other correlation results. Offers a flexible and friendly UI, and is available for desktops, mobile as well as web consoles. Alerts, Performance, and Network Traffic Views are linked to each other. Settings of multiple nodes can be changed with a single click. Equipped with Windows diagnostic tools. Dashboard Maps allow reviewing the status and performance parameters. Automatic creation of routing and Layer 2 Maps with update management. The licenses begin at $1,755 for a year with the Premium 50/1 package. NetCrunch is compatible with a number of network devices and components and provides remote-management capabilities thus adding to user convenience. ManageEngine OpManager Plus is a network management utility geared towards service providers, large enterprises and SME’s. It is capable of network, virtual and physical server monitoring. It allows for business views and L2 Maps, management of syslog and event log, TCP service monitoring and alerts via SMS and email. Network and Server Monitoring covers response time, packet loss and the metrics of network devices. Bandwidth analysis helps keep a tab on consumption by applications and users. Firewall Log Management assists in compliance and security. IP Address Management for availability and space. Alerts for faults at all stages via SMS and email. $995 for 25 pack, goes up to $23,995 for the 1000 Pack. 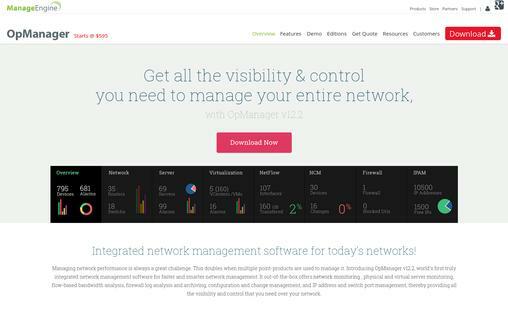 While it may be a little pricey, the tool does manage to make up for it with advanced features and capabilities, thus making it one of the most comprehensive of network management suites. 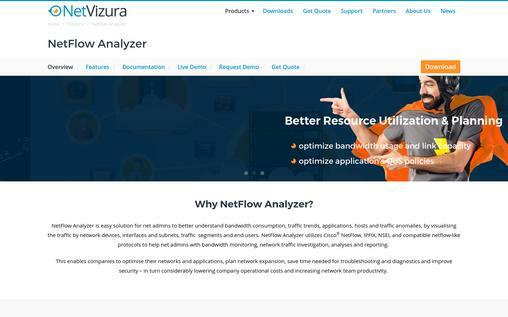 NetVizura NetFlow Analyzer is a one-stop solution for collecting, analyzing and reporting the use of the network resources. It is primarily targeted towards bandwidth monitoring, analyses, investigation of network traffic and reporting. Further, it helps administrators gain a better insight into the IP subnets, network devices, interfaces as well as end users to. Alerts for traffic anomalies and unusual bandwidth usage. Pinpoint applications and users contributing to excess bandwidth usage. Diagnostic tools for uncovering network issues. Web-traffic reporting for every user and application. Visualize traffic from devices, users and applications. $1,300 for a one-time purchase. The NetFlow Analyzer is ideal for those looking for better network security along with a greater detail of what is going on in the network. 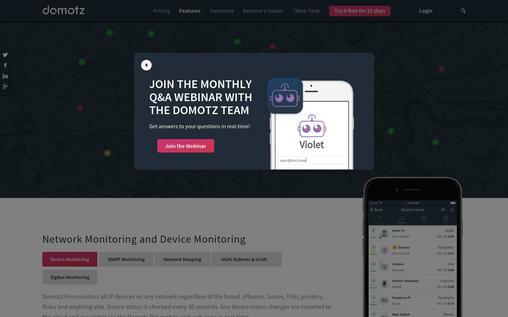 Domotz Pro is targeted for those looking to monitor their network as well as ensure digital or remote support for their systems. It has an automatic inventory of all the IP devices in a network, speed test, internet health, alerts for devices down and faults and a remote-power management web-app. 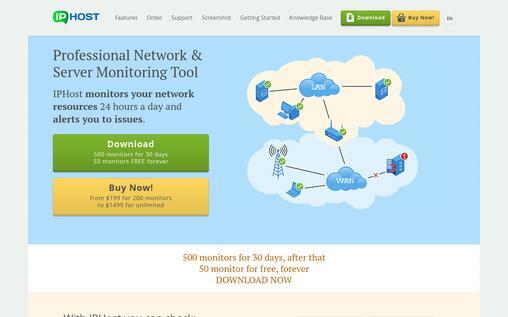 Monitor bandwidth utilization by all devices in the network. $2.99 per month per network, unlimited devices. As one of the most affordable choices, Domotz Pro is the ideal network management tool- and comes with a 60-day obligation free trial to help you get to know its capabilities. Nagios Network Analyzer is a powerful tool for network monitoring, designed to help you keep the critical systems and services running at all times. It comes with event handling, alerts and report capabilities. 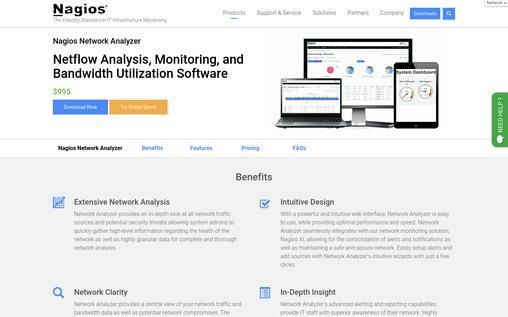 For the network admin looking to get a solution that covers all aspects of network management, Nagios Network Analyzer offers an easy and intuitive way. 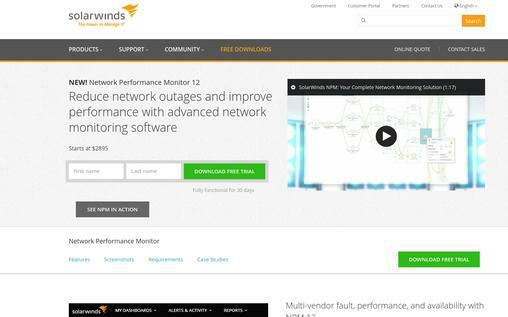 SolarWinds Network Performance Monitor is designed to help bring down network outages and improve the performance of the network. The tool is capable of network performance analysis, viewing the delivery path as well as critical path visualization without any limitations on the location of the devices. Respond to various conditions, network topologies and device dependencies. Insights into the health of service delivery infrastructure. Starts from $2895. Free trial for 30 days. 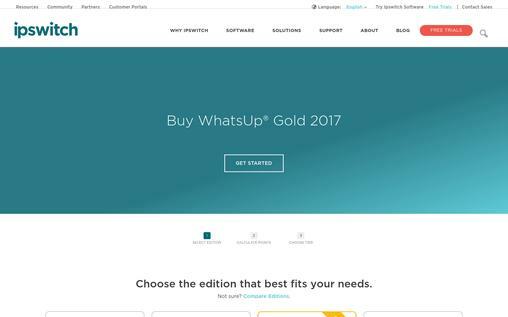 WhatsUp® Gold 2019 is a network-management suite for monitoring of network devices, servers, virtualization, applications and traffic all across the Java, LAMP and Windows environments. Starts at $1,77755 for the BasicView. It is a comprehensive and all-in-one tool for managing networks, applications as well as servers with a host of reporting and analysis tools. OmniCenter is a tool which is used to monitor, set alerts and report for applications, networks, and systems. It has a unified interface for all the components of an IT infrastructure from both device-level and end-user experience levels. There are a number of options to suit every size of the environment. 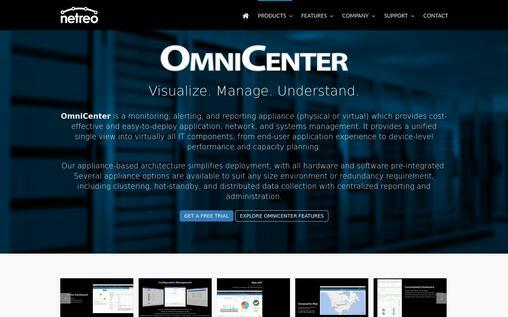 OmniCenter is not just a network management tool- but is the complete package of software that you need for monitoring an enterprise-wide IT infrastructure. With these network-monitoring tools, you can keep a better control over what goes on in your network and who uses its resources. This is one of the most effective steps towards ensuring security and efficiency for your organization with minimal hassle!